Team building activities don’t always have to feel mundane, or forced, or boring. They can be engaging, too, and a great way to help bring an entire office team closer than ever before, which can help boost office morale and productivity. Below are ideas for corporate team building games in Singapore that can help your team get to know each other better. Scratch planning too much for a team building activity. A simple barbeque party is good enough. Even if it’s done occasionally, like once a month, it’s a great way to offer your team something to look forward to after a long month at work. These gatherings may not sound like much, but it can help make your staff more engaged and communicative, while also encouraging teamwork and camaraderie. It doesn’t have to be a barbeque party either. It can be whatever kind of social gathering you can think of. Basically, the point is to get the entire team together and create a light-hearted atmosphere where everyone can just sit back, relax, and bond outside of the confines of the office. There are plenty of team building activities in Singapore that can bring everyone in the office outside and into the sun every once in a while. For conventional stuff, there are sports, like soccer, basketball, volleyball, and more. There are also other activities that you can do as a team, like a wall climbing, or paintball, the latter of which is a great way to get to know each other’s competitive side. Running a marathon as a team is also another idea for teams to bond outside of the office. If the company budget allows for it, go abroad. If not, then a bus ride out of town should be enough. Just think about it. What were the most memorable days of your school life? Where did you meet your best friend? Where did you bond with that kid who always bothered you on the bus? Field trips are where some of most people’s best memories growing up where made, and there’s no reason why, as adults, you can’t create lasting memories with your office mates while out on a field trip. The entire team can go to an art exhibit or museum, or watch a sporting event together, or a concern, or even a retreat. Either way, travelling is an excellent way to reward your employees and make them feel valued, while also creating and strengthening bonds with each other. Planning out the occasional time at the gym, or even a jog at the park, as a team is great for a lot of reasons and bad for very few. If nothing else, encouraging exercising together allows you to have a healthy, active, and productive workforce. A team that trusts each other communicates and knows each other’s strengths is a productive team, and a productive team is great for your company’s bottom line. 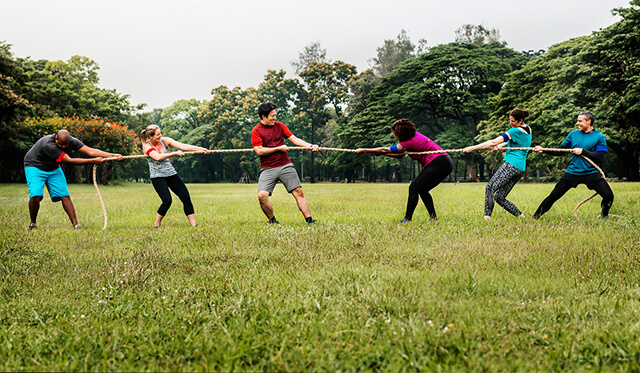 By investing in these team building activities, you can help make sure that your team is as tightknit as it can ever be.